The Meteorology Department has predicted that showers during the south-west monsoon period are set to get more intense with climate changes taking place due to variability of rainfall in the upcoming weeks. Moderate showers and thundershowers were reported this week from Kalatuwawa, Labugama, Neboda, Canyon, Kukuleganga, Hiniduma and Avissawella, the Met. Department said. The highest rainfall this week was 45.2 mm. at Padukka Estate while Illubuluwa Estate (in Sabaragamuwa) recorded 45.0 mm., Deputy Director and Climate Change Studies Chief Anusha Warnasuriya said. The surface wind was south-westerly in direction and speed was about 10-30 kmph, she said. 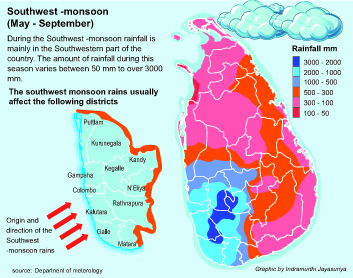 According to the available data, it is clearly seen that the south-west monsoon, which is usually confined to the western and south-western part of the island, is projected to have increased rainfall by 2025, she said. Met Department Director S.R.Jayasekera said it has been evident that increase in average annual surface temperatures across the country during recent times is largely due to the increase in night time minimum temperature than that of the daytime maximum temperature. “The minimum temperature at night was 3 degrees Celsius above the normal at Nuwara Eliya while the maximum temperature of 34.7 degrees Celsius was reported from Trincomalee, he said. “If the minimum night temperature, especially in the Nuwara Eliya District declines, it will have a huge effect on crops, seed, vegetables and fruits,” he said. The Hector Kobbekaduwa Agrarian Research and Training Institute (HARTI) Director Haputhanthri Dharmasena stated that vegetable prices have gone up due to the damage caused to crops by the heavy rainfall experienced a few weeks ago. He pointed out that farmers sell one kilo of cabbage at six rupees to the middleman, while it in turn is being sold to the consumer at Rs. 60 per kilo. “If the heat increases, it could affect the water resources and therefore some adaptation such as rainwater harvesting would be necessary, while de-silting of minor tanks especially in the dry zone, needed to be adopted to cope with the anticipated climate change,” he said. Meanwhile Health Ministry Nutrition Coordination Unit Director Dr. A.M.A.S.B Mahamithawa said children as well as adults must increase their intake of liquids such as water, citrus fruit juices and thambili water to prevent dehydration. “Children are more prone to dehydration especially after being exposed to the sun. It is important to take vitamins and minerals through food and fruits as excessive sweating would result in loss of minerals” she added. Dr. Mahinda De Silva, a dermatologist, said children especially fair-skinned ones need to protect themselves when they go outdoors. Dr. D.B.K De Silva, eye surgeon, said that, it is important to wear sunglasses with proper protection against the sun.